One of the great themes of Lover Eternal is the way in which low self-esteem creates barriers to an intimate relationship. Such barriers are based on false assumptions people have about themselves, and they often prevent us from living our lives to the fullest. Hypercritical self-images are a particular problem for women, especially when it comes to our looks. Mary can barely believe that someone who looks like Rhage would be interested in a “plain Jane” like her. She sees all her faults, and all he sees is her beauty. It takes a while for Mary to let go of that barrier. How, then, would you reconcile the theme of Lover Eternal with its emphasis on the physical beauty and fitness of its leading characters? “It was a tattoo come to life: a dragonlike creature covered with iridescent purple and lime-green scales. The thing had a slashing tail with barbs, long yellow claws, and a wild black mane. She [Mary] couldn’t see the fact, but the sounds it was making were horrific” (406-407). 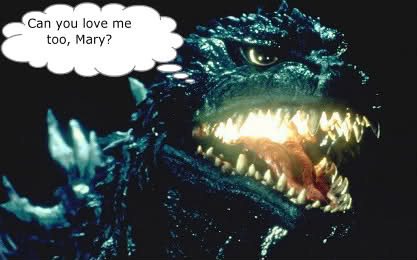 ‘He’s kind of cute, in a Godzilla sort of way” (Ward, Lover Eternal, 441). And yet Mary is able to calm this beast, and by the end of the book, accepts him as a “two-for-one-kind of deal” (441). Do you feel the novel stretches the limits of believability at this point, or does its genre, the paranormal romance, make room for this type of plot device? 1. Z bolted for the door, but the Scribe Virgin got there first, forcing him to spin out to a stop so he didn’t run her over. Trapped in front of the diminutive figure, his legs trembled and his shoulders shook. She talked to him quietly, the words not carrying far enough for Rhage to decipher through his haze of pain. Finally the Scribe Virgin motioned to Phury, who brought the weapon over to her. When she had it, she reached out, took Z’s hand, and placed the leather-bound grip on his palm. She pointed to the altar and Zsadist dropped his head. A moment later he came up front with a lurching stride” (256, CH 29). Why do you think Zsadist reacted the strongest to seeing Rhage in pain? Also, why does Zsadist have such a hard exterior if we can see from this scene he cares more than he usually shows? 2. “Rhage took a deep breath. There was the most amazing…emptiness in him. No background buzzing. No itchy drive. No burning. And this was even though he was lying right next to Mary. “It was…only him in his body. Just himself. The Scribe Virgin’s curse was gone. “But of course, he thought. She’d taken it from him temporarily so he could make it through the rythe without changing. And she was obviously giving him a respite so he could heal, too. He wondered how much longer the reprieve was going to last” (274, CH 31). Why did the Scribe Virgin pity him after the rythe? Will she finally take the curse away? 1. 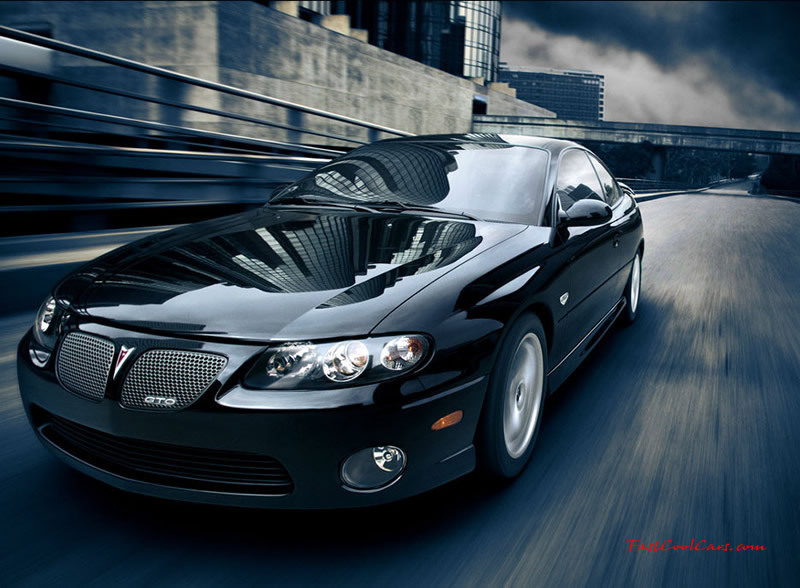 “Mary put her window down, letting the air rush in. The blast tangled in her hair and chilled her cheeks and woke her out of the numbness she’d been in since she’d left the doctor’s. She started laughing, and even though she could hear the edge of hysteria in her voice, she didn’t care. She stuck her head out into the cold, screaming wind. And let the man and the car carry her away” (131). Why does Mary insist that Rhage accelerate his engine and go even faster? Do you think Mary starts to become less fearful of life when she is with Rhage? Describe how Mary begins to lose her inhibitions while around Rhage. 2. “‘Say my name.’ ‘David,’ she whispered.’ When she hesitated, he pricked the skin of her neck with the tip of the blade. Her blood welled up and slid down the shiny metal. ‘Say it’” (115). What is O’s fascination with his identity? Why would he need an affirmation from a prostitute he’s never met that she loves him and knows his real name? Is this need enough to kill for this affirmation going to hurt him later on? 1. “So, again, I have to ask myself, are you worth it? You’re only three years into the society. You’re strong, you’re effective, but you’re proving impossible to control. I put you with Primes because I assumed you’d fall in line with their level of excellence and temper yourself. 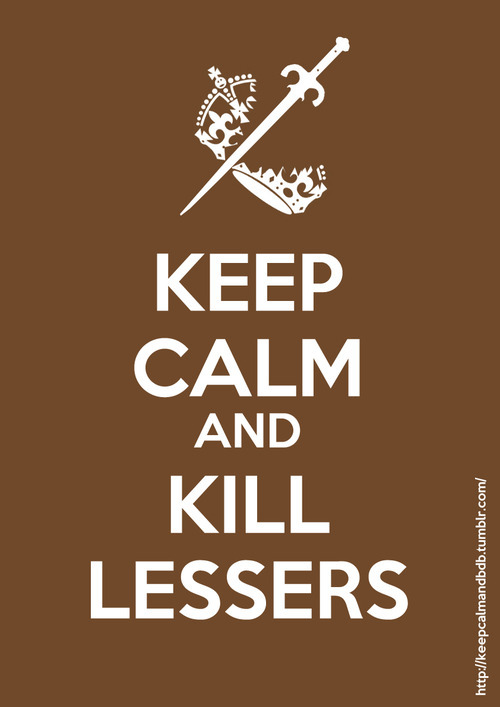 Instead you killed them” (55-56). Why is Mr. X so disappointed in O? What are Mr. X’s future intentions with O, based on what this dialogue? How do you think Mr.X would have reacted if he believed what O had said about the killings? How may have Mr. X handle the situation differently? 2a. “And she didn’t look like a party, either. The unremarkable hair growing out of her head was pulled back tight and cinched in a scrunchie. The creamy Irish knit sweater she had on was baggy and warm. Her khakis were comfortable, and her flat were brown and scuffed at the toes. She probably looked like the mother she would never be” (80). How would you describe how Mary is feeling about her dinner date plans based on her appearance? 2b. “He was blond. Movie-star beautiful. And monumental in a black leather trench coat.His shoulders were broad as the door he’d come through, his legs so long he was taller than anyone in the place. And as he strode through the knot of people in the entrance, the other men looked down or away at their watches, as if they knew they couldn’t measure up to what he had going on” (81). What impact did Rhage have on the restaurant’s atmosphere? In which way is the theory of hyper-masculinity and alpha-male dominance in this novel pronounced based on this exert? Describe the author’s intent behind exemplifying the differences in appearance of each character. 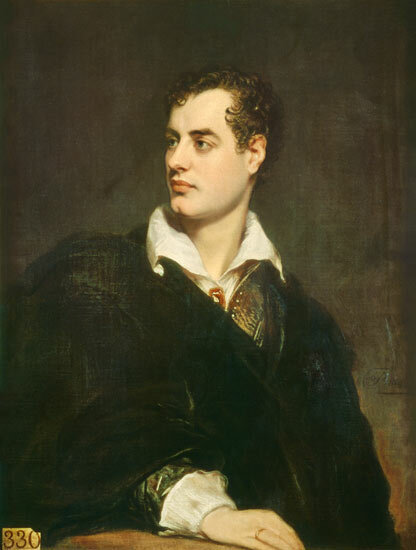 George Gordon, Lord Byron (1788 – 1824). Portrait by Thomas Phillips, 1824. Courtesy of Wikimedia Commons. “’Naturally, you are the master of your own household.’ she said. ‘I have never met a man more adept at managing, everything and everybody. But even you can’t think of everything, or look for what you’ve never experienced. I daresay there are benefits you’ve never imagined to having a wife’”(Chase 214). Why does Jess feel that Dain needs to change? Why is Dain so reluctant to change for Jess? 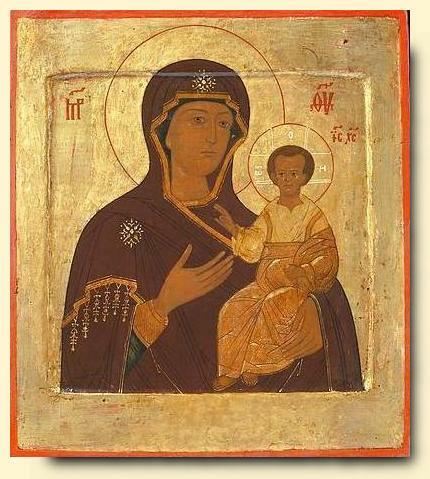 Virgin of Smolensk. Russian–Stroganov School, late 17thC. “He turned and looked down into his wife’s pale upturned face. Her eyes were wide with shock. Then, incredibly, they were glistening…..with tears. “’How dare you?” she said, angrily blinking the tears back. ‘How dare you, of all men, call your mother a whore?’ You buy a new lover every night. It costs you a few coins. According to you, she took but one–and he cost her everything: her friends, her honor. Her son'” (Chase 233). How has Dain’s feeling toward his mother effected the way he treats women? Will he ever be able to forgive his mother? Cover of Lord of Scoundrels. 1. “’It seems we have an audience, Miss Trent,’ Dain said. His voice dripped scorn. Coolly he pulled her bodice back up and yanked her skirts back down. There was nothing protective or gallant in the gesture. He made her feel as though, having had a look at and a sampling of what she had to offer, he’d decided it wasn’t worth having. She might have been a trumpery toy displayed upon Champtois’ counter, not worth a second glance. “And that, Jessica understood as she took in the chilling expression on his countenance, was what he wanted those watching to think. He was going to throw her to the wolves. That was his revenge” (Chase 117). Why does Dain come across as if he is ashamed of Jessica? Is he more concerned with his reputation than her feelings? Is there a reason why he addresses her as Miss Trent and not Jessica? How do you think Jessica feels about his reaction to the audience? 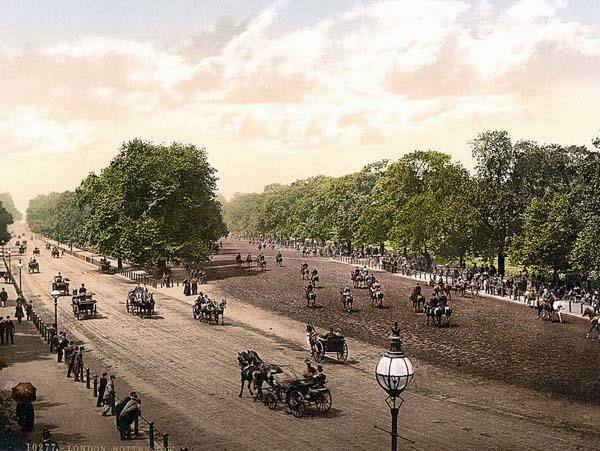 Rotten Row–a track located on the souther side of Hyde Park in London. Jess and Dain take their carriage (curricle) ride in Hyde Park. “He brought his full attention upon her for a moment, and his sullen gaze dropped to where her hand was. She hastily returned it to her lap” (Chase 149-50). Why does Dain not openly admit his feelings for her? Does her witty comments inhibit Dain from declaring his love? Is there a reason behind Jessica moving her hands so that the focus isn’t on her chest? Is she secretly hurt by his comment of buying her? 1. “Her accents proclaimed her a lady. Worse–if there could be a worse species of humanity–she was, by the sounds of it, a bluestocking. Lord Dain had never before in his life met a female who’d even heard of an equation, let alone was aware that one balanced them” (Chase 26). 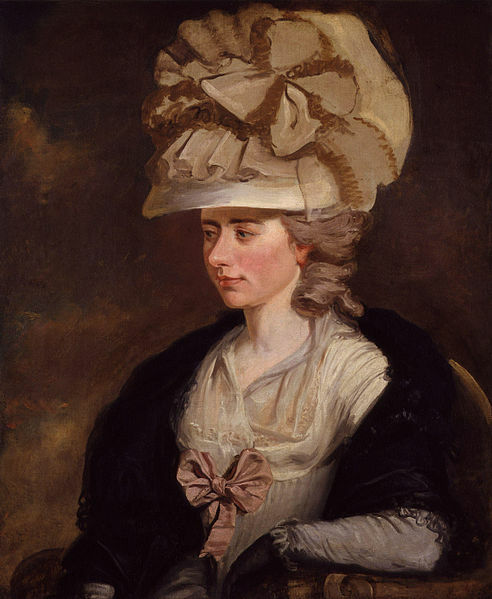 Novelist Frances (Fanny) Burney. Portrait by her brother, Edward Francis Burney, c. 1784-1785. Located in the National Portrait Gallery, London. Courtesy of Wikimedia Commons. Burney was a “bluestocking,” a term coined in the 18thC to refer to an intellectual or educated woman. Socialite Elizabeth Montagu organized the Blue Stockings Society in the 1750s in an effort to cultivate intellectual discussion among women. Dain has always viewed certain types of women in a stereotypical way, but Jessica is different. What it is about Jessica that disrupts Dain’s assumptions about certain types of women? Do you think this scares or is intriguing to Dain? How? 2. “Since the encounter at the coffee shop, he could not bear to have Bertie out of his sight. Wherever Dain went, whatever he did, he could not enjoy himself unless Bertie was there. “Bertie, of course, believed he’d finally won Dain’s undying friendship. Gullible baconbrain that he was, Bertie had no idea that the alleged friendship was Dain’s revenge on her. 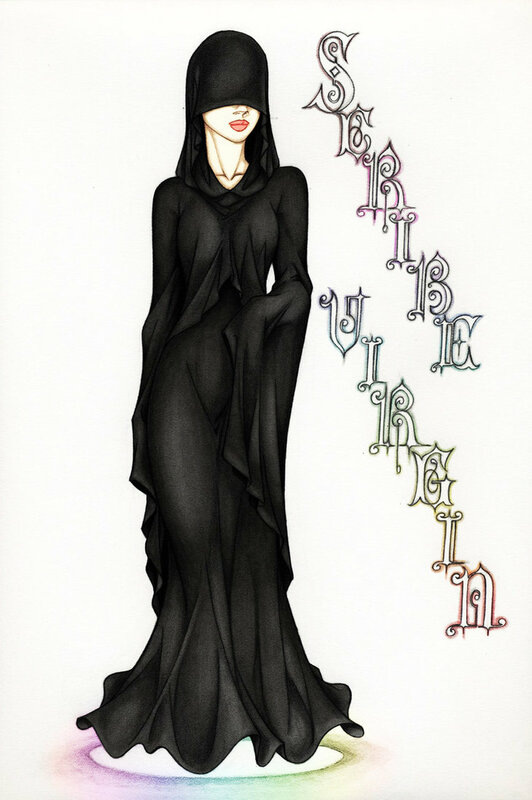 “Which only showed how despicable a villain Dain was. His quarrel was with Jessica, but no, he couldn’t fight fair and square with someone capable of fighting back. 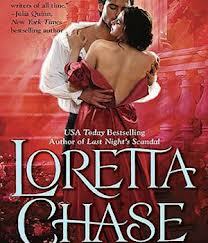 He had to punish her via her poor, stupid brother, who hadn’t the least idea how to defend himself” (Chase 67-68). Bertie is an important character in Lord of Scoundrels. What function do you think Bertie plays in the courtship of Dain and Jessica? In what ways do you think Bertie’s situation hinders Jessica’s feelings towards Dain? Sheik Ibraheim Omair, played here by Walter Long (1879-1952), captures Diana Mayo. 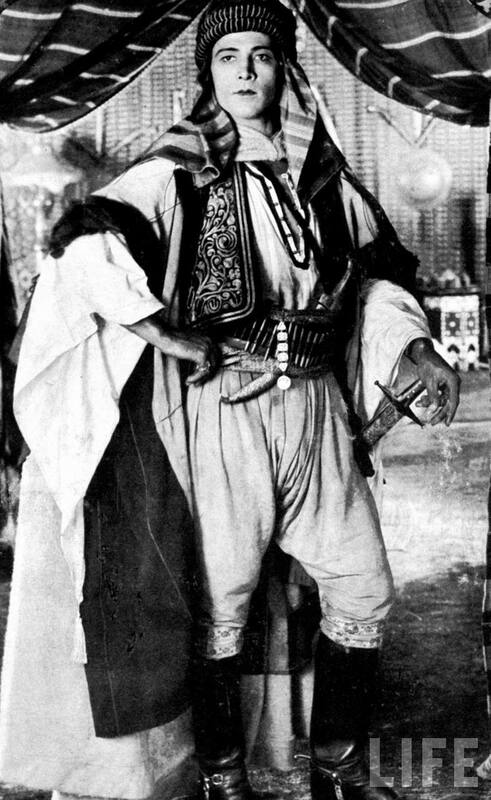 From The Sheik (1921). Long appeared in D. W. Griffith’s Birth of a Nation, where he played an African American slave. 1. “Diana paused for a moment framed in the entrance, then, with head thrown back and swaggering, boyish stride, she moved across the thick rugs leisurely and halted in front of the chief, looking straight at him with haughty, curling lips and insolent, half closed eyes. The hold she was exercising over herself was tremendous, her body was rigid with the effort, and her hands deep down in her pockets clenched till the nails bit into the palms. Every instinct was rebelling against the calm she forced upon herself” (Hull 154). When Diana was kidnapped by the Sheik her attitude and behavior was very different compared to how she acted when kidnapped by Ibraheim Omair’s men. In what ways does she act differently? What do you think contributes to the change in her demeanor? 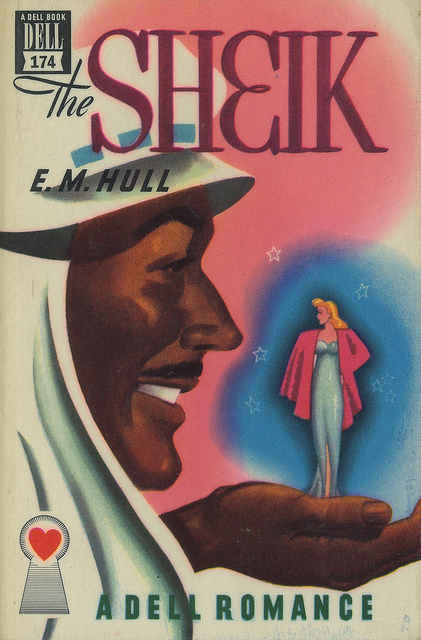 The Sheik. Reprint. Dell Romance Cover, 1947.
hand stealthily from behind her. 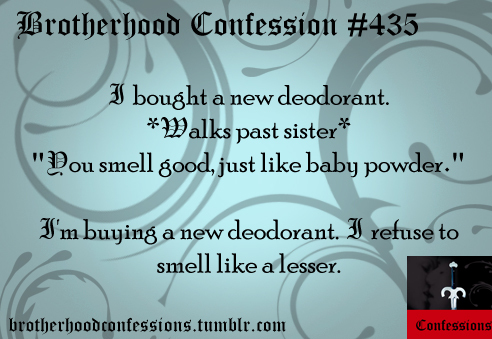 She looked at it for a moment dispassionately. She was not afraid. She was conscious only of an overwhelming weariness, a longing for rest that should still the gnawing pain in her breast and the throbbing in her head…. A flash and it would be over, and all her sorrow would melt away…. But would it?” (Hull 204). Many of us have been in relationships where we were or we thought we were in love. People break up and go through depression in which they make foolish decisions all the time. However, if we are all still here then we were never pushed to the point where we took our lives. What do you think pushes Diana to attempt (and come uncomfortably close) to taking her own life? Do you think this might have been her love that pushed her to it or some other emotion (i.e. revenge, stubbornness, hysteria)? 1. “For the first time since she had shaken off Gaston she began to think seriously. What she had done was madness. She had no food for herself or her horse, no water, and Heaven alone knew where the next well might be. She was alone in an uncivilized country among a savage people with no protection of any kind… in which case death from hunger and thirst stared her in the face” (59). Diana has always been an abnormally independent and strong willed person until now. She has never been one to lose faith in herself or think of any task that presents itself to her as unmanageable. Since she was kidnapped by the Sheik, her self confidence is not as prominent and she seems much more likely to give up. Why do you think the past month that she has spent with the Sheik has taken away that courage? Is it completely gone, or is there still a glimmer of her courageous character left within her? 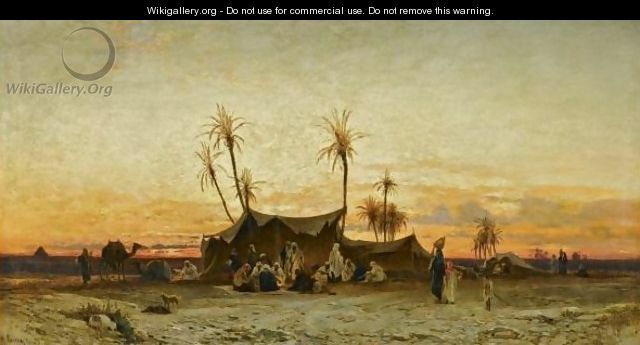 An Arab Encampment at Sunset, by Hermann David Solomon Corrodi, C. 1864 – 1905. 2. “She lifted her head for the first time and looked at the magnificent sky. The sun had almost set, going down in a ball of molten fire, and the heavens on either side were a riot of gold and crimson and palest green, shading off into vivid blue that grew blacker and blacker as the glory of the sunset died away. The scattered palm trees and the far-off hills stood out in strong relief. It was a country of marvelous beauty, and Diana’s heart gave a sudden throb as she realized that she was going back to it all” (63). The imagery is very uplifting and positive in this scene. It provides the image of a kind of paradise and that Diana is glad to be back. What were your thoughts during this scene? Was this the point at which the reader detects the love that Diana has for the Sheik? Woman in knickers smoking cigarette and looking at man doing laundry. Underwood and Underwood, c. 1901. Library of Congress. 1. “By contrast the girl at his side appeared vividly alive. She was only of medium height and very slender, standing erect with the easy, vigorous carriage of an athletic boy, her small head poised proudly” ( 9). How does Hull’s description of Diana’s physical appearance play an important role in showing the idea of the “new woman” that began around the time the novel was written? How does this make Diana more relatable to modern readers? 2. “It was the handsomest and cruelest face that she had ever seen. Her gaze was drawn instinctively to his….she shrank back, quivering, dragging the lapels of her riding jacket together over her breast with clutching hands, obeying an impulse that she hardly understood” (44). How does the imagery used in this scene foreshadow the possibility of a future relationship between the Sheik and Diana even though there was nothing explicitly said?